iPhone and iPad users, it's time to fire up your phones and tablets to update iOS. 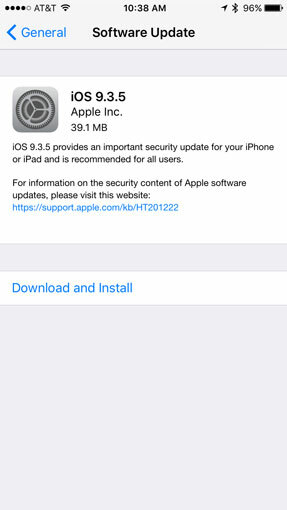 While iOS 10 is likely to be out in just a few weeks, Apple just released iOS 9.3.5 which fixes three serious security vulnerabilities. Apple's quick turnaround on releasing a patch—just 10 days after these issues were reported—is a sign of just how serious the problem is. The vulnerability allows hackers to access your location, view any data on your phone, track keystrokes to see things like passwords and text messages, and even use the device's camera and microphone to spy on you. In short, if you're caught by this exploit nothing on your phone is safe from prying eyes—even encrypted messages like those sent through WhatsApp or iMessage can be seen by hackers. Hackers already know about the exploit—and have used it. Investigators discovered that a company called the NSO Group was taking advantage of the vulnerability in their surveillance software and that software is thought have been used to try to track a prominent human rights activist in the United Arab Emirates, Ahmed Mansoor, among others. Since this vulnerability is not only known but also being used, you don't want to wait to download this patch. You should update your phone and tablet today. One of the biggest dangers is how easy it is to have your phone or tablet compromised by this exploit. All you have to do is click on a link in a text message, which could appear to come from a legitimate source. (And even with this exploit fixed, you should never click on links sent by strangers because you don't know what they are.) Once your phone is compromised, you may not even realize it. Fortunately, all you have to do to nix this vulnerability is update your smartphone or tablet to iOS 9.3.5—which only takes a few clicks to accomplish. If your phone or tablet isn't set up to automatically back up, you'll want to back it up before installing the update—while it's rarely necessary, it's good to have a backup before installing any iOS update just in case something goes wrong. Backing up to iCloud is the simplest method, presuming you have space on your iCloud account. Go to Settings > iCloud > Backup and click "Back Up Now." (If you don't already back up automatically, you can turn on automatic iCloud backup here, too.) If you'd prefer, you can also back up to your computer via iTunes with these instructions from Apple. If you haven't done a backup lately, this is likely to be the most time-consuming part of the process. After that, it's quick to update your iOS over Wi-Fi. Go to Settings > General > Software Update. It will take a moment for your phone to see the update, but when it does click "Download and Install." The file clocks in at 39MB, so it shouldn't take long. Once you have the file, click "Install." While your phone may ask you for your passcode, this is the last step. (If you run into any trouble, check Apple's update instructions for help.) The process shouldn't take more than 10 or 15 minutes and you'll have your phone (or tablet) back—and you'll be safe from potential hackers. Anyone hacked over the weekend? If my iPhone's already been infected will the update solve the problem? I think my iPhone’s being monitored by an aggressive human resources contractor and I’ve been followed on personal time by private investigators. Couldn’t figure out how they where doing it. Then two weeks ago, used iMessage to communicate with family about where I was, and one of the bad guys showed up. So I think its my iPhone. Will this update fix the problem if the phone has already been hacked. I installed the update, but think they may still be accessing my phone.